Do you leave them in the silicone Muffin Cups or do you remove them? If you leave them do you leave them in the cups when you microwave them? Thank you. I take them out of the silicone cups, both for storing and reheating. 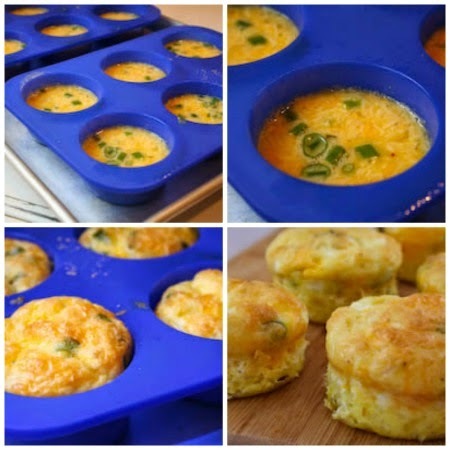 I really love egg muffins! And yes, there are all over the internet now and even I had made my own version… but really glad to know that you are the creative mind behind naming these cute little babies! These look really good. I was wondering if they could be made in the microwave. Thank you. I haven’t ever tried that. I’ve had eggs “explode” in the microwave, so I wonder if that might happen but if you try it I’d love to hear how it goes. This looks amazing. I love your idea. Can you make them without cheese? It upsets my tummy. Thanks! Absolutely! Pretty much any combination of meats and veggies is good if you stick to the approximate proportions given here. Hope you enjoy! Hi I was wondering if you can freeze the egg muffins. I have tried them and they are super. I used to freeze them when I first started making this recipe years ago. But when you thaw and reheat they release a lot of water, and I think they’re better just refrigerated. They will keep at least a week in the fridge, and I can usually finish them off by then! These turned out great. I did use paper muffin cups. I will spray them with pam next time. They were very tasty though! So glad you enjoyed and glad to hear the paper muffins cups worked for you! How many muffins are one serving? I usually only eat one, but heartier eaters will probably want two. These sound great and I’d like to try but I have a question regarding seasoning. I can’t use Spike because I can’t eat garlic and onion (fodmap diet). If I were just to replace with salt and pepper, would you recommend the same amount, 1 tsp of salt? If not can you suggest appropriate measurement? I was on an airplane for 8 hours when you left this comment, so sorry if you already tried it. Spike has only a small amount of salt, so I wouldn’t use nearly that much if you replaced it with salt. When I said replace with a seasoning blend that’s good with eggs, i was thinking of another mix like Mrs. Dash or Season Salt. But if those have ingredients you can’t have I’d just replace with a very small amount of salt and pepper, the amount you’d use if you were seasoning scrambled eggs. Thanks Kelly; so glad you enjoyed! HI. I hope you still check these comments. I make these in jumbo silicone cups. No matter what I do I keep ending up with hocky pucks. Tough and rubbery. Tried baking at 325 for 35 min and tried 400 for 10 minted. The eggs inflate and collapse some but they still turn out rubbery. At 10 minutes the inside was still kind of liquid and the outside was dry. There is no way for me to know what is causing this bad result for you, but I can assure you I have made these over and over for more than 15 years now, following this recipe and always having a good result. Are you using enough filling ingredients along with the egg? Do you start to check them when they start to look brown and the eggs have set; that is why I give a range of times because different ovens and different combinations of ingredients will take slightly different cooking times. I really don’t know what the problem is, but sorry you are not having success with them. How do you keep the egg muffin from imploding as soon as you take it out of the oven? That has never happened to me after many, many times of making them! I don’t have any idea what might be causing it. Mine always sink down a bit after I take them out of the muffin. I wonder if you’re beating the eggs too much; that’s the only thing I can think of. 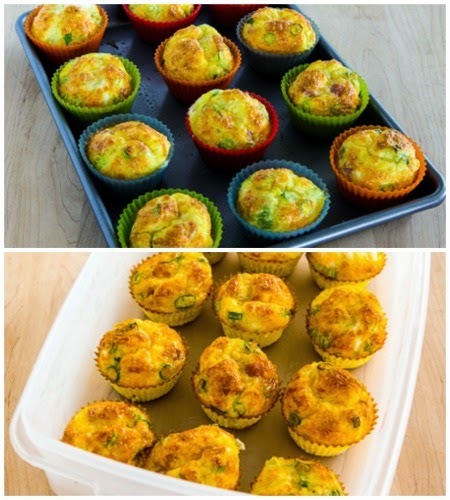 This is the best recipe for Low Carb Egg Veggie muffins I have found. I experimented using the microwave, and they actually came out great! Followed the recipe, using various cooked veggies I had.. used parchment cups in a six cup plastic microwave muffin pan. Filled each cup about 3/4 full with mixture including cheese. Microwaved about 90 seconds on High (maybe a bit more till bottoms are fully cooked). I also then top browned them in the toaster oven for about a minute, though this step isn’t really necessary. They’re a bit more moist from the microwave, but if you cool them on a rack, they dry out a bit. Really good, especially if you’re pressed for time. Thanks, glad it is helpful for you. Interesting to hear it works in the microwave. i guess I have to try that now! I’ve just discovered these and am really enjoying making and eating them! So easy and delicious. So far I’ve made ham and Mexican shredded cheese mix, and the same with chopped green chiles added. The possibilities are endless and a good way to use up small amounts of leftovers. I’ve been using a regular size nonstick muffin pan. I grease it with canola oil, and the muffins fall right out. I’m looking forward to trying more combinations. If I cook them in a regular metal muffin tin, without paper liners, do you think I should reduce cooking temp to 350 degrees? I don’t have the silicone cups and after reading a bunch of reviews on AMAZON am not sure I want to buy them. I love the silicone muffin cups, but your choice of course. I had a lot of trouble with them sticking to the metal muffin tins, no matter how much non-stick spray I used. Not sure if a lower temperature will help with that, I haven’t tried other temperatures. ok….did you buy your silicone from amazon? if yes…would you mind tell me exactly which ones you bought? 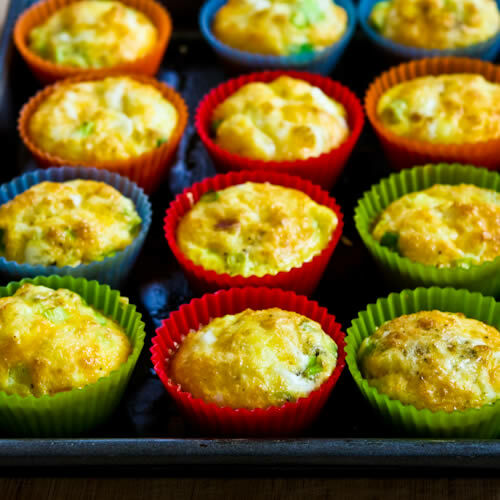 Several say they are smaller than regular muffin tins, others say not 100% silicon and that is a problem, still others say cleaning is a nightmare…I would value your input into which ones to buy…thx!!! Sorry I am slow getting back to this. I wasn’t home when the comment came in and missed it! 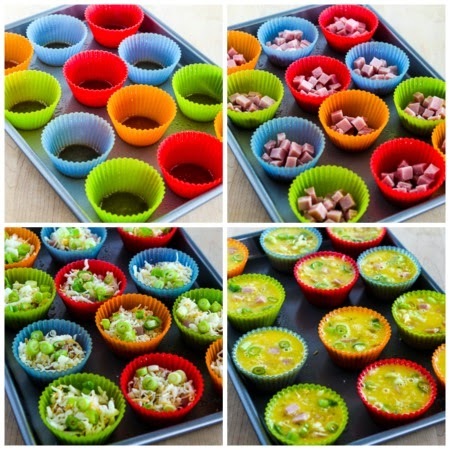 Here is a post about the silicone muffin cups I like with Amazon links to the ones I have. Hope that helps. Have to say I like these more than the pressure cooker ones. Love the grab and go option! Thanks Letty! When I taught school I used to eat them in the car on the way to work. Been making these for more than 10 years now! And so easy to make vegetarian! This recipe is an older one, but definitely a keeper. I make a batch about once a week and I use part whole eggs and part egg whites (my preference). With more egg whites they "fall" and don't keep their shape very well, so in tonight's batch I added 1 T of almond flour to see if that would do the trick to stabilize them …. and Voila it was a success. I love, love, love these. Thanks for sharing that! I bet the almond meal adds good flavor too; I am going to try it! So glad you've been enjoying the recipe. I make the phase one stuffed peppers that don't have rice. I always have way too much filling left so I make egg muffins with the leftovers for dinner the next day. Very creative, I like the sound of that! Anthea, I haven't ever tried a sweeter version like you're describing, but I am intrigued. Let us know if you try it! Has anyone thought of, or tried to do these muffins with fruit, ie banana slices with some ricotta,vanilla and stevia, and the egg, of course? Amanda, not sure why I haven't had that problem. I let them cool on the counter and then store in a plastic container with a snap-right lid or in the individual plastic bags. I open the bag when I microwave then. Sorry but I am stumped about this. I live in Utah where there is barely any humidity, so that might be a factor. I enjoy making these but how do you keep the excess moisture out of the bags? I've done everything I can think to do. I've wrapped the eggs in paper towels, which just soaks the paper towel. And because of all the moisture, the muffins do not last more than 2 or 3 days before becoming a soggy mess. I've let them cool on the cooling rack for at about 30 minutes to make sure they were cool all the way through, and still I get the excess moisture built up in the container I store them in. Put a paper towel into the container or bag you refrigerate them in. Handles the moisture, easy peasy! Good idea! As I said below I have never had that problem so I was stumped. Glad you enjoyed it! And you're right that the silicone muffin cups do come in different sizes. I have made these two different ways. The first was "Mexican" style with green peppers, onions, cumin and cilantro. Probably would have been better with a sharp cheese but I didn't have any on hand. The SECOND time I made them was with sauteed white onions, garlic powder, and shredded parm. SO GOOD. Thanks for sharing! Also I must have small silicone pans because I only used 13 eggs (and took out 5 egg yolks) and I still threw away about 1/3cup. I also used a lot of onions. I would suggest to your readers though to try fewer eggs first so they don't waste any. Though you can always use extra uncooked egg for a scramble. Terri, I love that idea, will definitely try it. Hi, I make these a put a spoonful of almond meal in the bottom after spraying the muffin cups. It makes a psuedo crust. Try it… Yummy! I have made these many times and over time I have added and subtracted new ingredients. I tried putting half a raw pilsbury refrigerated biscuit on the bottom add egg and other stuff on top then bake. My son loves them. Its how we make them all the time now.They have become a quick on the go food choice. Very yummy….not gluten free or carb free but tasty! Irene, paper liners will definitely not work for this. I like them best with a lot of filling too, but if yours are puffing up really a lot you might also try not beating the eggs so much. Enjoy! Use LOTS of filling (veggies and meat) and just enough egg to hold it together or it will puff up like a soufflé and be hollow in the centre. Also USE SILICONE CUPS ONLY, I tried paper liners with cooking spray and it was just a mess. They still tasted great so I will try them again with these fixes. I love the idea of adding a little sour cream; thanks for sharing that!